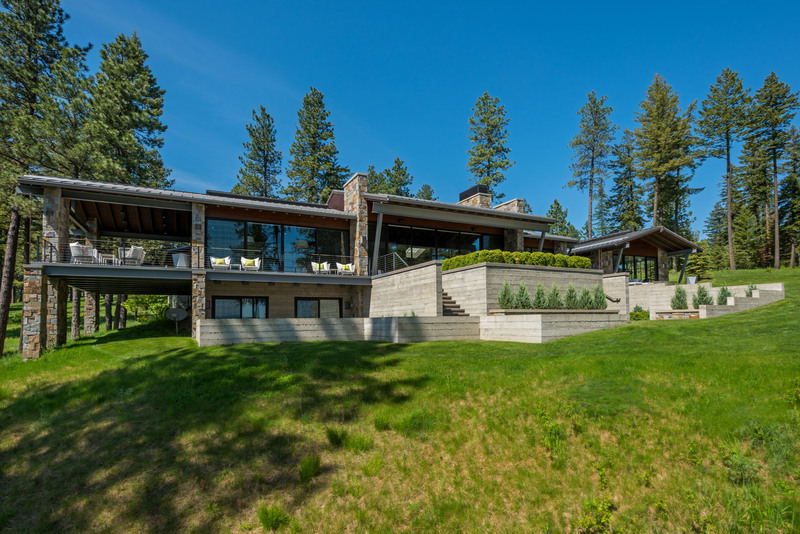 This 6,000 square foot, 4 bed, 4.5 bath custom home in the Black Rock community on Lake Coeur d’Alene, melds contemporary design with nature by using materials of steel, glass, wood and stone. 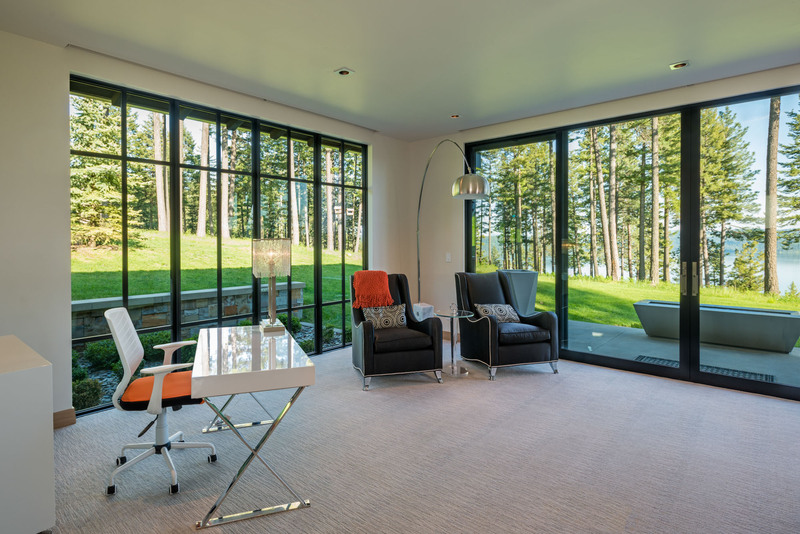 The primary challenge presented by this project was the multiple wall-length expanses of retractable glass throughout the house bringing the expansive lake view and surrounding nature into the home. 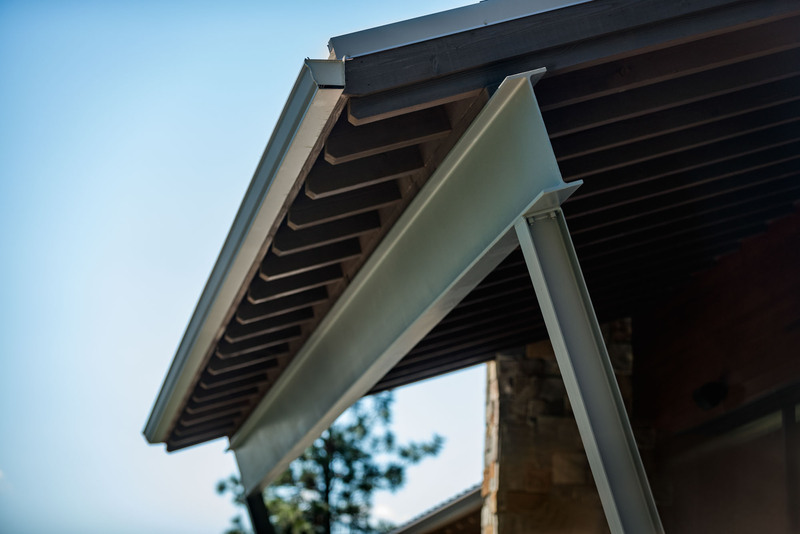 Structural steel framing was used to provide the support needed for this beautiful design. 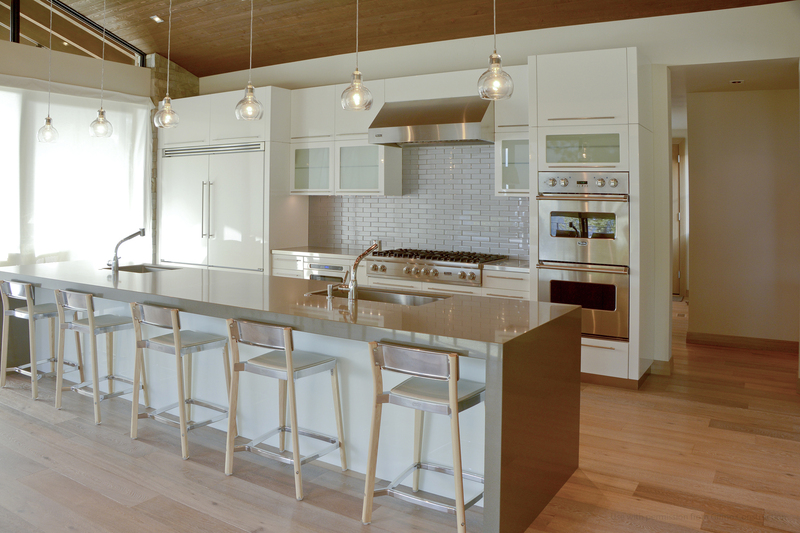 This home was built by general contractor, Matt Fisher under Ginno Construction. Matt is now building luxury custom homes as owner and president of Shelter Associates. 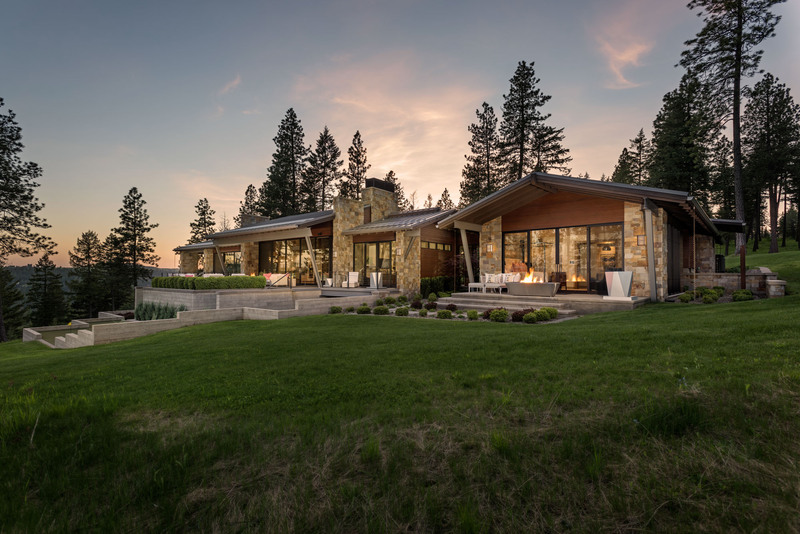 Along with the steel framing of this Black Rock home, this lifetime steel roof offers outstanding load-bearing ability for the sometimes heavy snow of northern Idaho. 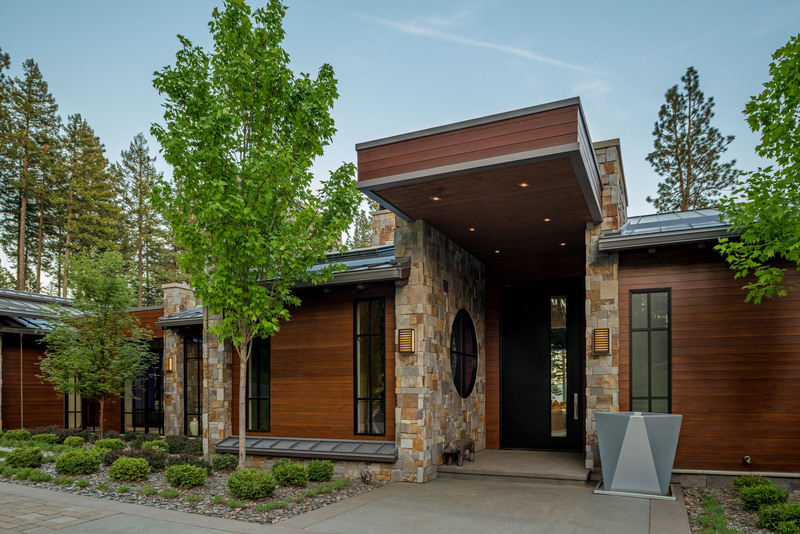 Though the steel and glass throughout the design offer a contemporary edge, the home integrates nicely into the surrounding nature with the natural stone and wood materials throughout. 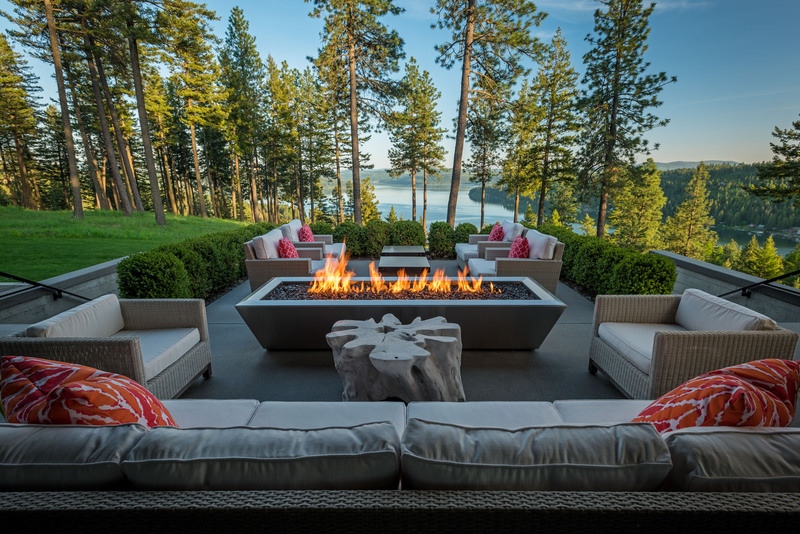 Steel framing, steel roofing, floor-to-ceiling glass, stonework, wood siding, concrete terracing, gas fireplaces, and landscaping all came seamlessly together for maximum exterior impact. This grand portico entry makes a bold statement to visitors, which this home easily lives up to. The floor to ceiling masonry of this low-profile fireplace provide a strong focal point in this great room to compete with the lakeview outside the wall of windows. The glass walls of this home’s great room hide away into the walls and open onto this gracious patio, extending both the living area and the seasons. With two walls of windows and its own private patio, the master suite offers privacy while bringing the outdoors in. Floor-to-ceiling windows in the day makes this master suite feel like a garden, but the motorized shades hidden in the ceiling offer privacy when needed. The glass-walled theme of this home extends to the office with a view. Note how the stonework starts inside and extends seamlessly outside the wall of windows, creating an inviting entryway into the outdoors. 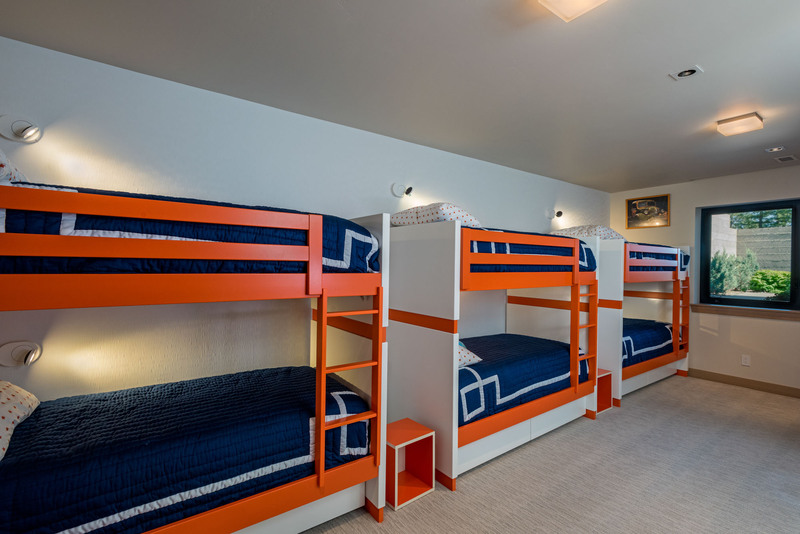 Textured wallpaper and individual built-in lights provide each visitor with a cozy space of their own in this fun bunk room. 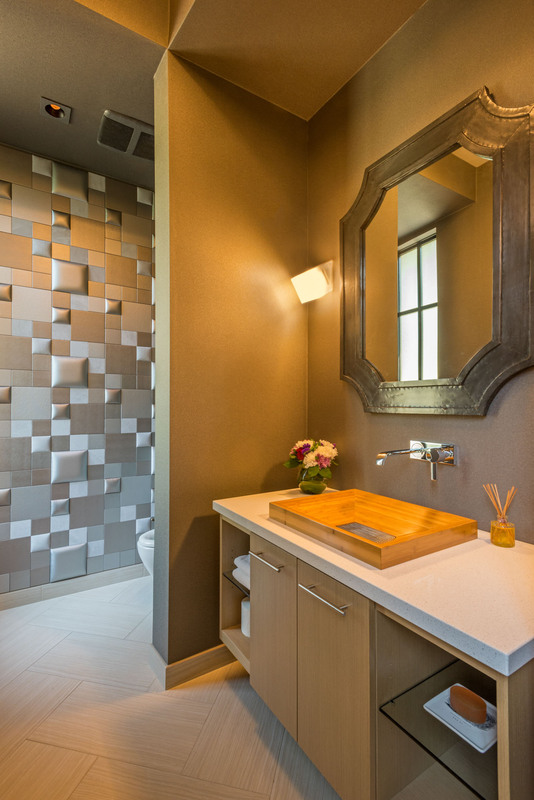 The metallic 3-dimensional tiled wall (a fun challenge for the tile craftsmen) offsets the more natural elements of the room including the wooden sink basin and stone-like paint throughout. 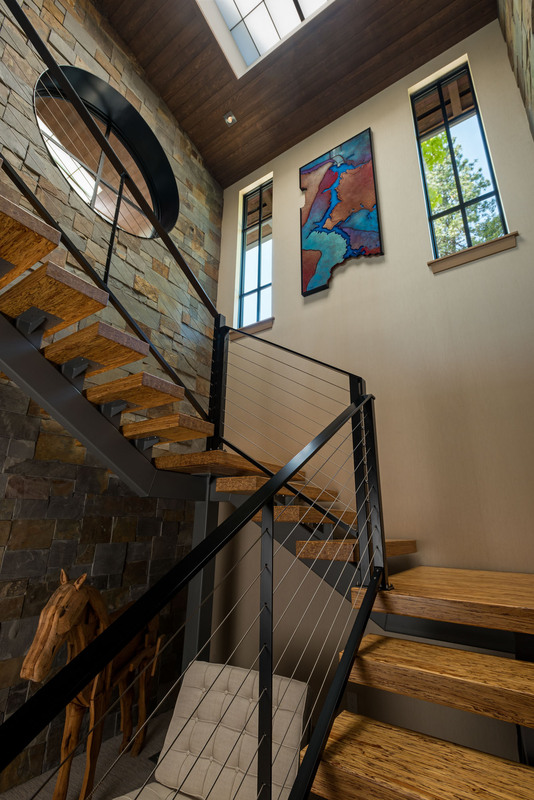 Round window, stonework, low-profile rails and beautiful floating wooden treads make for an incredible staircase! This sleek contemporary kitchen is bright and cheery with quartzite countertops, an island containing 2 sinks, built-in fridge, microwave and dual ovens. With the extended gas stove-top, this kitchen is perfect for entertaining the guests…or just whipping up a quick meal for the kids at the counter. 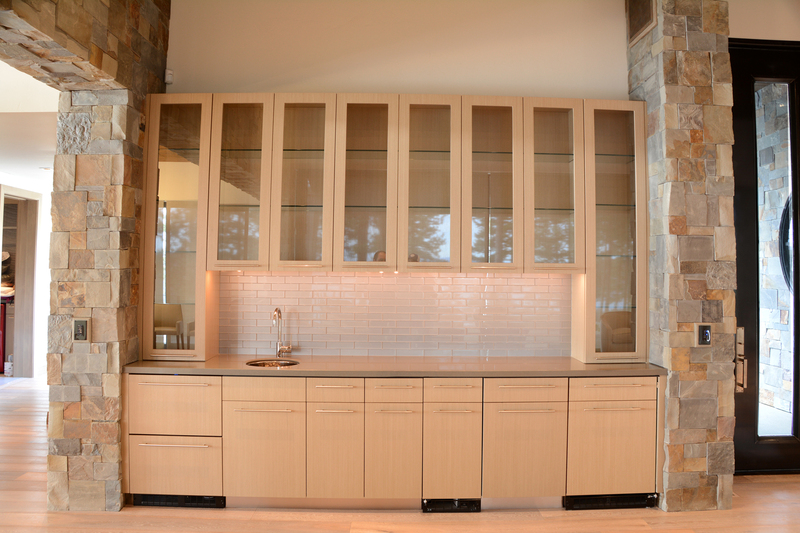 This custom-created, built-in wet bar with quartzite counter, offers all the hidden amenities to entertain the guests in style. With the expansive lake views, the wrap-around patio with both open areas and covered, along with the terraced landscaping take an important role in the daily living around here. The low-profile railing is nearly unnoticeable from the inside, as well! The steel-beamed framing of this home is not only functional, but creatively integrated as artwork into the design of the home.